The Christie's auction is highlighted by two good-size oil paintings by Thomas Cole (1801-1848), the founder of the Hudson River School. Cole's works have surprisingly not fared well at auction in recent years despite his absolute importance. 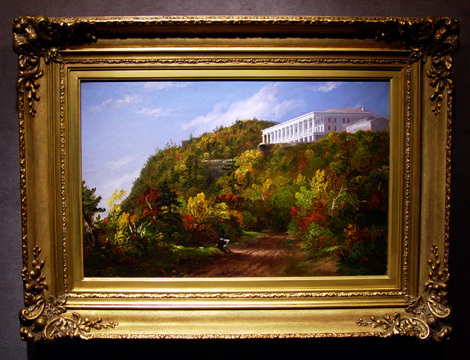 Of the two, Lot 14, which is entitled "Catskill Mountain House," is the more important. A medium-size work that measures 15 by 23 ¼ inches, the catalogue maintains it was painted about 1845-8. It has a very modest estimate of $400,000 to $600,000. It sold for $1,463,500 including the buyer's premium as do all results mentioned in this article. Cole, of course, is best known for his thunderstorm scenes of the Catskills that usually are larger, 29 by 36 inches, and for his great series of paintings that are even larger but already in institutions. By all rights, the Catskill storm paintings should be selling for $2,000,000 to $5,000,000 but they have had trouble, inexplicably, getting to $1,000,000 in recent auctions. At some point that will change. The Catskill Mountain House was a very, very famous resort in the heart of Cole's beloved Catskills. While this is not a storm scene, it is an unusual and compelling composition. 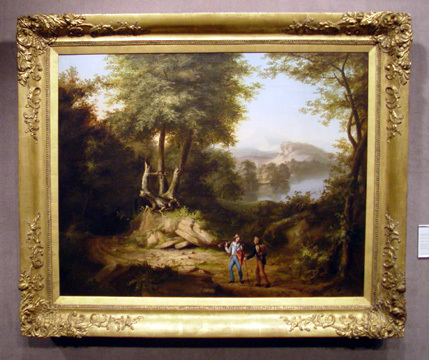 The other Cole, "Hunters in a Landscape," is Lot 23. It measures 28 ¼ by 35 ½ inches and was painted 1824-25 just before Cole really blossomed and became famous. It has a modest estimate, given its size, of $200,000 to $300,000 and was once in the well-known collection of Richard and Gloria Manney. It sold for $231,500. Christie's also has two good paintings by John F. Kensett (1816-1872), one of the most important Hudson River painters who also became known as a Luminist. 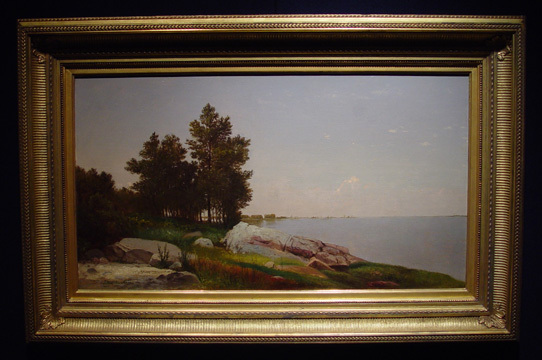 Lot 9, "Study on Long Island Sound at Darien, Connecticut," is being sold by the Amon Carter Museum. It measures 15 ½ by 27 ¾ inches and was painted the year Kensett died. It is one of his wonderful shore pictures and has a modest estimate of $250,000 to $350,000. While not one of his masterpieces, it is very representative and very nice. It sold for $231,500. Incredibly, another Kensett from the Amon Carter Museum is Lot 17, which has the same estimate. Entitled "Waterfall in the Woods with Indians," it measures 17 by 24 inches. 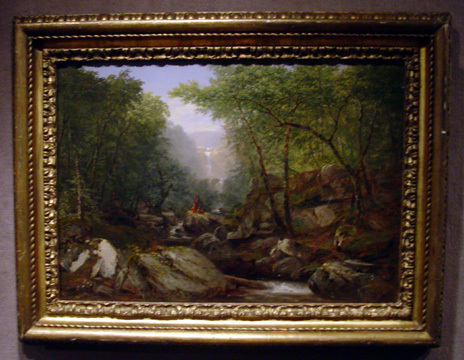 Apart from his shore and lake pictures, Kensett is famous for his woodlands scenes such as "Bash-Bish Falls." This is unusual in the minimalization of the waterfalls in the center of the picture. It sold for $455,500. 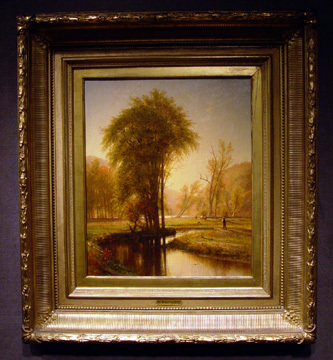 Lot 43 is a very lovely work entitled "Indian Summer" by Thomas Worthington Whittredge, an important second-generation Hudson River School artist, who also did some great Western scenes. The 18 ½-by-15 ½ inch oil was painted around 1870 and was once in the great Phillips Collection in Washington. It is very, very nice and has an estimate of $80,000 to $120,000. It sold for $95,600. John Henry Twachtman is America's greatest Impressionist painter, although his oeuvre can be uneven. Lot 31, "Gloucester Harbor," is a very beautiful oil on panel that measures 13 ¼ by 22 ¼ inches. It has a modest estimate of $100,000 to $150,000. It is the most beautiful painting in the auction. It sold for $276,300. 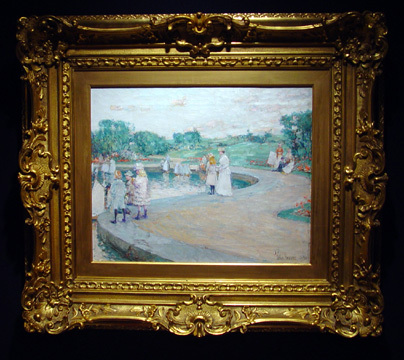 Childe Hassam (1859-1935) is better known than Twachtman and Lot 30, "Children in the Park, Boston" has a very high estimate of $2,500,000 to $3,500,000 presumably because it is very reminiscent of Central Park scenes by William Merritt Chase, the other great American Impressionist. It is an oil on canvas that measures 15 by 18 1/2 inches and was executed circa 1889. It failed to sell. The cover lot of the Christie's catalogue is a work by Winslow Homer. It is Lot 47, "The Last Days of Harvest." An oil on canvas, it measures 12 ¼ by 20 inches and is dated 1874. It has an ambitious estimate of $1,500,000 to $2,500,000 and is being sold by the Strong Museum. It is not an exciting or great Homer. It sold for $1,127,500. 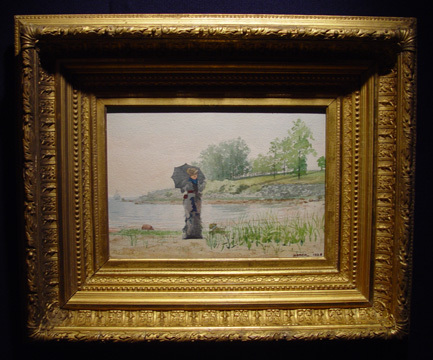 The Strong Museum is also selling a Homer watercolor, Lot 26, "Young Woman." This 9 ½-by-13 ¾-inch work has an estimate of $500,000 to $700,000 and is quite pleasant. It was executed in 1880. It sold for $511,500. Lot 83 is a extremely fine oil on canvas by Maurice Prendergast (1859-1924). 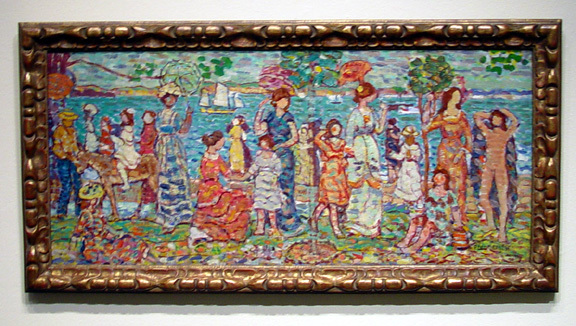 Entitled Promenade," it is 19 by 42 inches and was painted in 1914-5. It has a modest estimate of $500,000 to $700,000. This wonderful painting is a property from the collection of Mr. and Mrs. Leo S. Bing. It is museum quality and sold for $1,911,500. 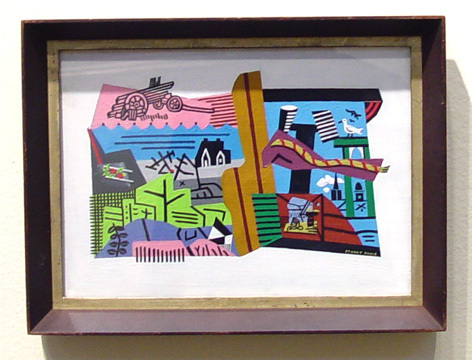 Lot 96 is a small but delectable oil by Stuart Davis (1892-1964). Although it is only 10 by 14 inches, his abstract works hold up wonderfully and this comes from the collection of Dorothy C. Miller, a very important curator at the Museum of Modern Art, whose collection has been selling very, very well this season. This has been in important exhibitions and has a conservative estimate of $250,000 to $350,000. It sold for $623,500. 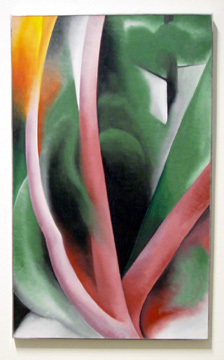 Lot 88, "Birch and Pine Trees Pink," is an excellent Georgia O'Keeffe (1887-1986). The 36-by-22-inch oil was painted in 1925 and has an estimate of $1,200,000 to $1,800,000. O'Keeffe is a little uneven in her varied oeuvre, but this is very strong. It sold for $1,799,500. 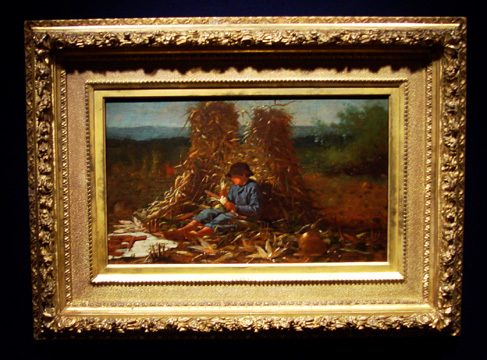 Lot 24, a very sweet genre picture by Eastman Johnson (1824-1906), entitled "Little Boy on a Stool," an oil on canvas that measures 8 3/4 by 6 3/4 inches sold within its estimate for $45,410. Lot 25, "Unconscious of Danger," a quite adorable genre picture by Seymour Joseph Guy (1824-1910), sold within its estimate for $$71,100. An oil on canvas, it measures 20 by 16 inches and was once in the collection of Mr. and Mrs. Julian Ganz Jr. Lot 63, a stunning and unusual watercolor by Childe Hassam (1859-1935) that was entitled "Thunderstorm on the Oregon Trail" sold for $65,725 almost double its high estimate. It measures 16 1/2 by 22 inches. Another Hassam, Lot 91, "Autumn Landscape, East Hampton," sold for $220,300, considerably over its high estimate of $150,000. An oil on canvass, it measures 39 1/2 by 73 3/4 inches. A very striking work by Armin Hansen (1886-1957), Lot 92, "Decoration," sold within its estimate for $343,500. 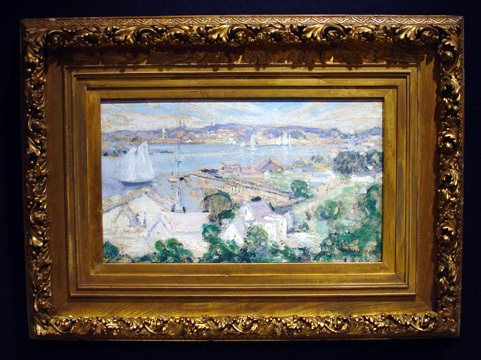 An oil on canvas, it measures 34 by 38 1/4 and the sailboat scene is quite reminiscent of the style of Jonas Lie.